Quick! Quick! I need to hurry. If there's a place where there's still a whole lotta shakin' going on at the moment, it's my beloved Chile. I'm going! No disaster tourism, at least not intended, I just happened to have a real bad timing in booking my ticket. For the road, I need some earth-shattering tunes (ha ha) and I've found them in this set. Perhaps Goldwax needs an introduction; not to you of course, dear readers and downloaders, but it's strange to see Wikipedia doesn't have an item on it. No time for that, this 2CD is by Ace and has plenty to read in the booklet, albeit most of it is about the songs. I suppose there's more to read on the label in the booklets by volumes 2 and 3 which I intend to upload as well (somewhere in the distant future). Pictures are from the records, not the artists but I suppose it's alright since this a compilation of singles. Soul, R&b, C&W, some great names, some completely unknown. Singles only, A and B sides. Mind the time: '62 to '66. More advanced stuff in the next volumes as it's chronological. 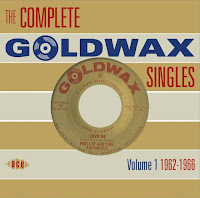 "Goldwax" means damn good records and they're true to their name. Enjoy, don't expect an update before April but I'll try to have something shockin' and shakin' again by then.